Looking for a quick way to bump your house into a Smart Home? 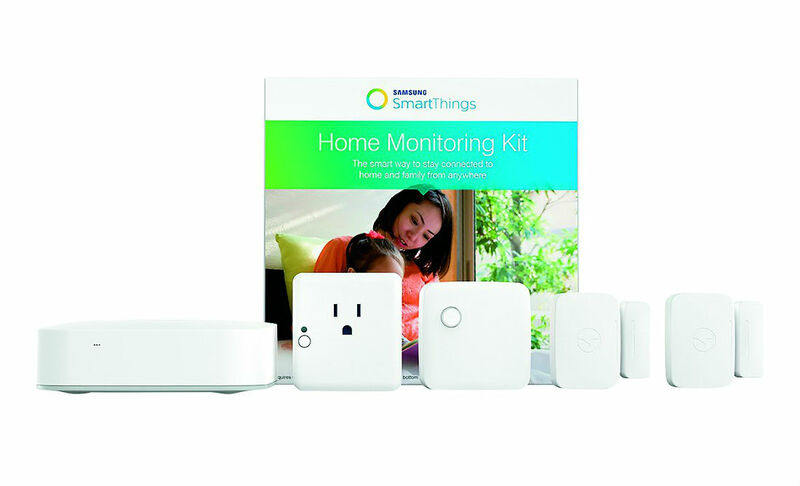 Samsung is now selling a package of SmartThings goodies, priced at $249, called the SmartThings Home Monitoring Kit. Inside, buyers will have the SmartThings Hub to connect all sensors, cameras, lights, and locks, in addition to the accessories you need for the Hub to be real useful. To go with the Hub, buyers receive two Multipurpose Sensors to monitor whether doors, windows, cabinets, or your garage are open or closed, in addition to a Motion Sensor to monitor movement in your home. The last piece of the Smart Home bundle is an Outlet to control lights, electronics, and small appliances. To use all of these products, all you need is the Android or iOS SmartThings applications, which then manages all of this tech. For example, lights can be controlled from your phone, videos from installed cameras can be loaded (not included in the bundle), notifications for when movement is detected will pop up, and much more. Other products can be added to the SmartThings hub, such as door locks, cameras, and alarms. All of these products can then be managed with the SmartThings Hub, as long as they are compatible with the system. Separately, all of these items would run you a pretty penny, but when bought all together, the price is just $249. For those keeping track, that’s the same price of a Nest 3rd Gen, which makes this a pretty good deal. Samsung also states that select stores will be carrying a Samsung SmartCam HD Pro alongside the Monitoring Kit. Right now, you can find this Kit on Best Buy, Amazon (will be live shortly), Sears, and the Samsung Store.